Marc Chagall is a famous artist and graphic artist born in Vitebsk in a simple Jewish family, this is his pseudonym, his real name is Moishe Segal. He wrote in different styles and genres, trying to show the world from different sides. Joy, sadness, despondency, freedom, reason, madness, etc., endow all his works. Sometimes, the mixing of feelings on canvas splatters over the edge. It is necessary to get used to his works, not everyone is perceived in an easy and simple way, it is important to think, think and even fantasize while thinking up the plot. This is interesting and unusual, this is not often seen in the art world. Chagall wrote several hundred paintings, each of which is a masterpiece, though not to someone’s liking, but still a masterpiece. 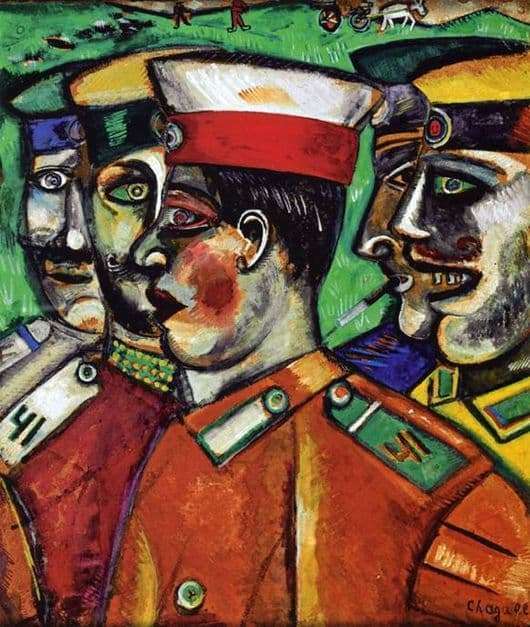 One of these creations is the original and somewhat strange picture of Marc Chagall “Soldiers”; she was not included in his collection of biographical creations. The picture was created in Paris in 1912. She performed in the style of portraiture in the genre of cubism. The picture is strange, and sometimes terrible. Soldiers are depicted with different eye color: green, red, orange, white. They are truly Cuban military uniform, and bright, the color of the eyes of soldiers. This is a kind of challenge to the world that the artist conveyed through the soldiers. The proportions obviously do not coincide with reality, but this is the idea of ​​the artist. He wanted to make the world think about life, let the soldiers, but they are also people. There seems to be no plot, but the action is huge. Here, obviously, monumental art slips through, which is enriched with colorful lyricism by means of a master’s pen. Many people do not understand what the idea is, why “it” is here, but that is all. No wonder Chagall’s paintings were exhibited in the Tretyakov Gallery and presented to the audience as they really are. There was a lot of controversy and disagreement in the circle of painters, which means: If there is a dispute, then all this is not in vain, it was started.